The word sewer tends to invoke images of large, rat infested tunnels beneath city streets. Yet your home contains its own miniature sewer system. Every drain in your home has its own pipeline which connects to the primary sewer line. This main line in turn connects your home to the municipal sewer system of your town or city. Blockages in the secondary lines are a common plumbing issue and rarely are a cause for concern. Conversely, a problem with the main line is a serious matter which may lead to extensive property damage if not addressed. Please note that homes which include a digester or a septic system function differently than homes with sewer systems, and some information may therefore not apply. 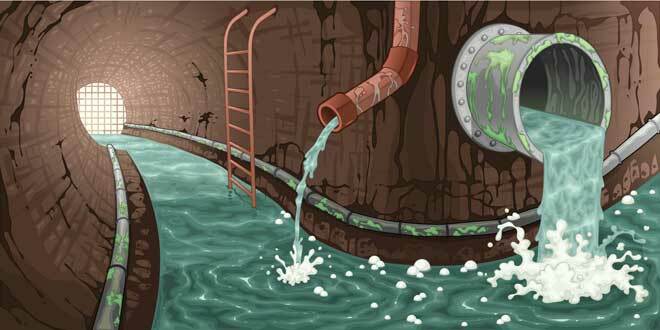 Your sewer system is designed to prevent water from flowing in the wrong direction. Under normal circumstances, water leaving your drains passes through several features designed to prevent the back flow of wastewater and gasses. This system may break down for a number of reasons, some minor but many of which may lead to property damage or health issues. When water drains from your sink or toilet, it must pass through a U-shaped pipe known as a P-trap. There is always an amount of water left in this section, which prevents gasses from venting out of your drains. These gasses instead exit your home through a vertical vent pipe. 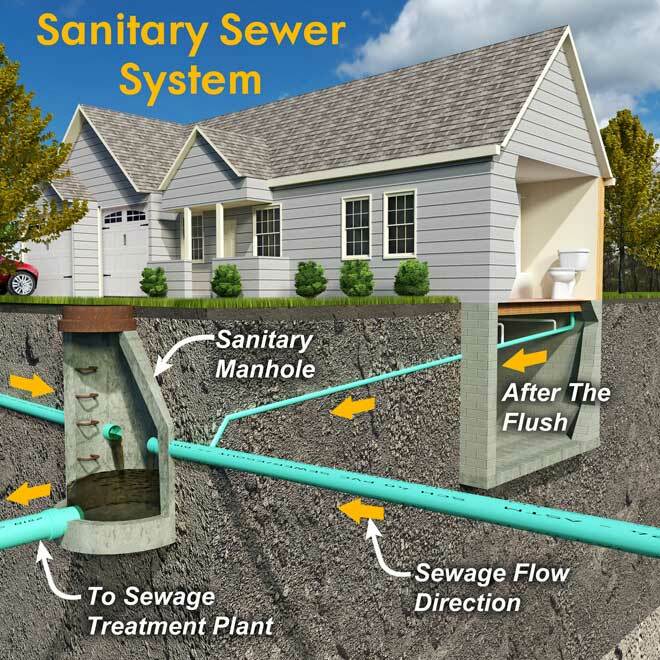 Meanwhile, the wastewater pipes merge into a main sewer pipe, known as a sewer lateral, which leads out of your home to connect with the community’s sewer line. The latter is a large pipe which runs down the middle of the street and is known as a sanitary main. One of the most common causes of sewer backup is flushing items down the toilet. While toilet paper is designed to break apart easily, too much may create a blockage. As water pressure pushes the clog deeper, it packs down into a mass which usually requires drain cleaner or snaking to remove. Other objects such as personal care products, napkins, paper towels, and baby wipes are also common causes of household clogs. If these clogs reach your main sewer pipe, it could create backups throughout your home. Another common, less obvious cause comes from your landscaping. Tree roots burrow deep into the ground over time and sometimes manage to pierce the sewer lateral. Left untended, these roots will continue to grow within the pipe until it is completely blocked off. This can be especially troublesome if the tree is located along a public sidewalk where the pavement must be removed to reach the damaged pipeline. Floods are another frequent cause of backups, especially after a drought. Debris can clog up the sanitary main or outdoor drains on your property. Most frequently, this type of backup leads to basement flooding through any floor drains. Unfortunately, poor drainage around the foundation may also lead to a flooded basement, so it is best to have a professional examine the flooding if you are unsure of the cause. There are several indicators that your sewer system may be backed up or at risk. Clogged drains tend to be the result of grease, hair, or other large debris getting caught in the pipeline. A single clog is not unusual and often easily remedied. However, if you are seeing multiple clogs simultaneously, it’s a good indicator that the sewer itself is clogged. This indicator is especially important if the clogs are occurring in drains you rarely use, such as a guest bathroom. Drain systems are designed to prevent backup. As a result, it is often easy to spot a pending or existing block by gurgling or bubbling in other drains. For example, flushing your toilet should not produce a gurgling sound in your shower. Likewise, your toilet should not bubble when you are using the washing machine. Another easily noticeable sign is a foul smell coming from your drains. A properly functioning drainage system will block gasses at the P-trap, helping to guide them into the vent pipe. Escaping gas suggests a major clog creating enough pressure to force the gas past the water in the P-trap. If your basement drains are overflowing, this is sometimes one of the first indicators of a clog in the sewer lateral or sanitary main. There are several ways to deal with a clog in your sewer system, depending upon the location and severity. Some of these methods are relatively inexpensive, although damage to the sewer lateral may require excavation or other expensive measures. Be sure to take photos and write an inventory of any items which must be discarded due to flood damage. Most minor clogs may be treated with a drain cleaner, especially those in secondary pipes. An inexpensive and natural solution is to pour one half cup of baking soda directly into the clogged drain, followed by one half cup of vinegar. Cover the drain with a damp cloth and let sit for five minutes before uncovering and flushing the drain out with steaming water. The chemical reaction creates pressure which is often enough to safely loosen clumps of hair or debris. If this fails, chemical drain cleaners may be purchased at most convenience stores. Follow the instructions carefully and keep children and pets away from the clog. Sometimes, a clog is deep or fails to break apart after multiple attempts using a drain cleaner. In such instances, your plumber will use a snake, also referred to as a drain auger. This long cable is sent into the pipe until it encounters a blockage. The plumber then uses the snake to drill into the clog, loosening it. The process is generally less than $150 if the clog is in a secondary pipe, but may run as much as $800 or more if the clog is deep in the primary pipeline. By accessing the lateral’s clean out (generally located where the lateral enters the home); a plumber is able to run a snake with a cutting head into the pipeline to clear out blockages between your home and the sanitary main. In the event the blockage is in the sewer lateral, it may be necessary to excavate the pipeline in order to make repairs. This is an expensive undertaking, which CostHelper estimates will cost from $3,000 up to $25,000 depending largely upon the excavation distance and complexity of the repair. Trenchless repair methods have a similar cost without causing further damage to your lawn or the sidewalk. Remove all standing water using a wet vac, rag, or sump pump. Open windows and use dehumidifiers to aid in ventilation and drying. Carefully remove and discard any solid waste or contaminated materials, including any carpets or furniture which have come into contact with the sewage. Thoroughly scrub the affected area to remove any trace dirt or sewage and allow the area to dry again. Using either a bactericidal disinfectant or a solution of one part bleach to nine parts water, clean the area again and allow the disinfectant to air dry. While the city is responsible for maintaining the sanitary main and other components of the city’s sewer system, they generally are not accountable for backups on your property. In most municipalities, the homeowner is held solely responsible for maintaining the home’s sewer system. This includes not only the pipes within the home, but the entire lateral up to the sanitary main. The city is held responsible for cleanup only in the event they are proven negligent in maintaining the sanitary main. As a general rule, the homeowner must pay for all repairs caused by backups, including any damage to sidewalks. In cases where a city-owned tree is responsible for root damage, you may only be responsible for part of the repair costs. There are several ways to prevent or reduce the risk of a sewer backup. Some simpler forms of preventative maintenance will help keep your sewer system clear, while other methods reduce the risk of storm-related backups. Periodically fill your sinks, and then allow them to drain simultaneously. The pressure will help flush any debris in the pipes. Use baking soda and vinegar whenever your sink or tub appears to be draining more slowly. Sink traps are a cheap and effective means to capture food or hair before they enter your drains. Disposing of grease properly will also reduce the risk of a clog. Municipal sewers are designed to contain a reasonable amount of wastewater but may be incapable of handling flooding from a major storm. To help reduce the risk of storm-related backups, make sure that your gutters and downspouts lead water away from the foundation and do not drain into the lateral pipe. Installing backflow prevention valves on drains located below ground level will also help prevent flooding. You may wish to consult a property map to locate your sewer lateral if your property has shrubs or trees. Consider removing any which are located close to the pipeline to prevent root invasion. You may also choose to replace the lateral pipe with PVC if it is an older or segmented line. Finally, seal any cracks in your foundation walls to minimize the risk of flooding if your home lies at a lower elevation than the road in case of an overflow in the sanitary main. Should You Invest in Sewer Backup Insurance? Sewage backup is not generally covered in home insurance policies, although you may invest in a sewage backup rider policy. Sewage backup coverage generally costs between $40 and $160 per year. As all homes with plumbing carry some degree of backup risk and it is difficult to assess the condition of your lateral line without paying for a camera inspection, the question of whether to purchase a rider policy for a newer home is largely subjective. However, as older homes and neighborhoods or those in an area prone to flooding carry a significantly higher risk of sewer backups, the extra investment may save you money in the long run. A certification and Standards Developing Organization, the IICRC (Institute of Inspection Cleaning and Restoration Certification) serves more than 25 nations by providing guidelines and certification for professional cleanup companies. Their website includes a searchable database of certified cleanup companies. The Connecticut Department of Public Health has released a fact sheet regarding sewer backups. While released in 2008, the tips on dealing with sewer backups and prevention methods remain current. Another document released by the City of Papillion, Nebraska, provides a more detailed explanation of where a municipality may be held responsible for backups, as well as useful sample guidelines on how to file a claim.